For some people, scaling back your favorite makeup products for traveling is like trying to herd cats – impossible! Especially when many of your favorite products aren’t offered in space-saving sizes and leaving home without them is non-negotiable. Cut to hoisting your luggage on the scale to find it five pounds over the limit and knowing exactly what that five pounds consists of. Stowaway Cosmetics is the answer to your makeup bag woes. Stowaway Cosmetics is a pint-sized, TSA-approved cosmetic line. All of the products are minimized and some half the size of a standard tube of lipstick or mascara. This means that the prices are reduced to nearly half of what you’d normally dish out. 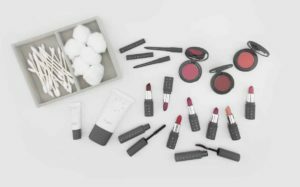 Their collection covers a full line for the face, eyes, and lips made with quality ingredients that are EU compliant, meaning the formulas are free of parabens and phthalates. And, while these petite beauties are great for travel, they’re also perfect for everyday use. Plop them into a small makeup bag and throw them into your handbag as you’re heading out the door. Trust us, they’ll be a dream come true when you need that mid-day refresher or evening-to-day transition look while at the office. Each product is sold individually or offered in a kit based on your lifestyle – aw, decision-making made minimally. This company loves Mother Earth as they offer a wonderfully incentivized recycling program. According to Stowaway Cosmetics, “75% of women don’t finish the products they purchase…” which is why their products make sense. They’re designed to be the right amount to use before they expire. So no waste! And to give their consumers a bonus, completely-used products can be returned to the company by using a pre-paid shipping label and they’ll honor this by offering a $5 credit for every three products returned.